I'm not sure just where it was that I first saw a reference to Cecelia Campochiaro's recently published book, 'Sequence Knitting'. I think it was somewhere in an Instagram post - maybe by tom of holland? Anyway, I liked what I thought sequence knitting might be - repetitions of simple sequences of plain and knit stitches to achieve a textured fabric. A kind of stitch dictionary organised around repetition. 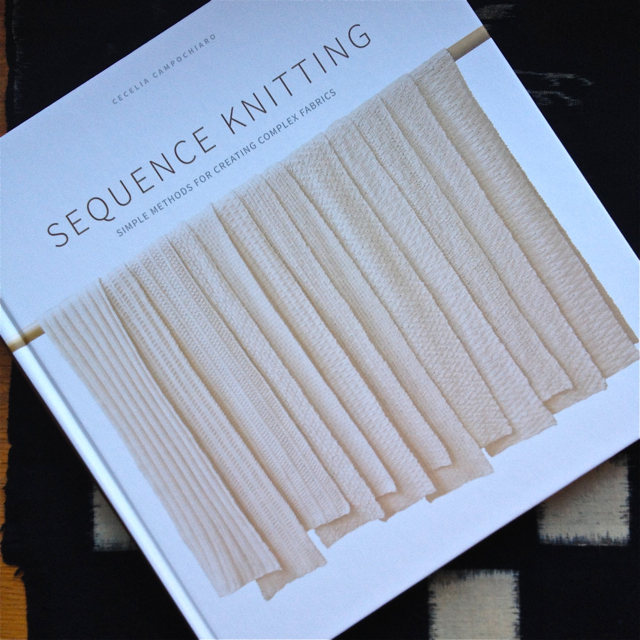 I wanted to know more, but 'Sequence Knitting' is a large, expensive book that's not (yet) available in Australia, and postage from the USA adds significantly to the cost. Fortunately, Cecelia had a pattern available through Ravelry - a scarf or cowl she's named 'Abelan', so I was set to try this new (or as Cecelia, after Elizabeth Zimmermann, says, 'unvented') concept for knitting. It was fun. You simply knit 9 stitches, then purl 3 stitches across a number of stitches that's a multiple of 12 stiches, plus or minus three stitches. (Cecelia's instructions are much clearer than mine!) This particular pattern is an example of what Cecelia has classified as 'serpentine' knitting where you carry the stitch repetitions from one row to the next over four rows to create the textured pattern. Indeed, I was so happy with the scarf that I did order a copy of 'Sequence Knitting' from the USA - despite its cost once I'd added in the postage. I haven't regretted my purchase for an instant. It's a beautifully produced book. Lovely paper, elegant lay-out, just enough colour, clear, helpful photographic illustrations of the stitch patterns described. And the content is just as wonderful as the book's physical form. You could say that Cecelia Campochiaro has produced a stitch dictionary. She has, but she's done so much more. She has looked behind the repetitions and sequences that produce the patterns and calculated the stitch formulas to produce a variety of textures. 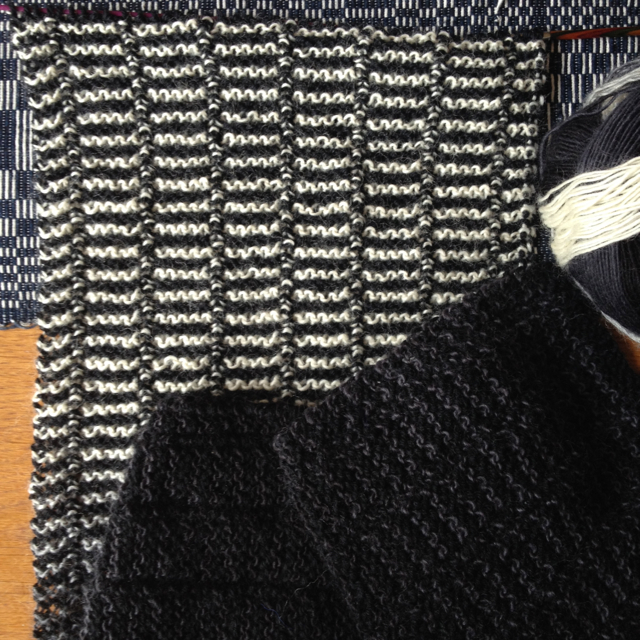 It's a combination of the binary of knit and purl with simple mathematics to calculate a dizzying range of possibilities. It's such a neat book - ordering, classifying, enumerating - lovely! 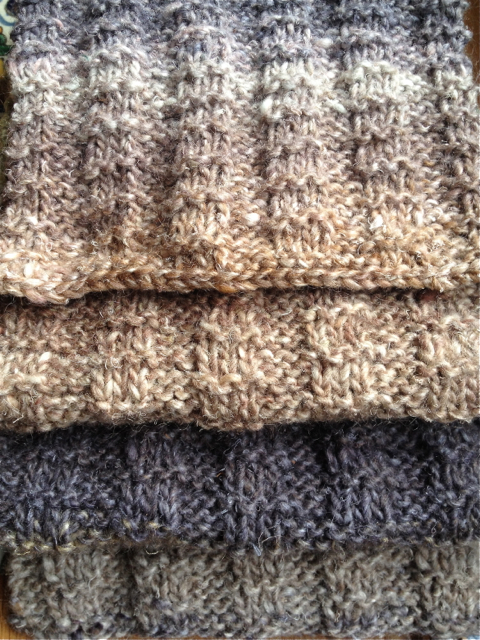 Once I received the book I hunted through for a formula for another scarf and chose a very simple repetition of 5 plain stitches then one purl. 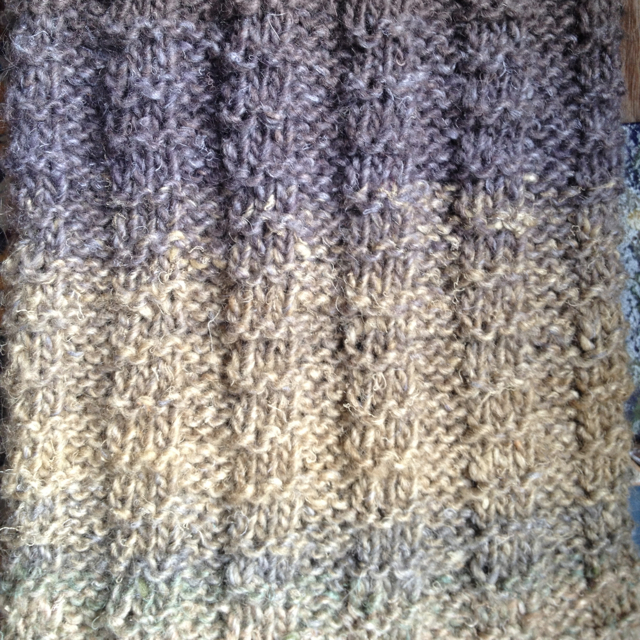 This in not a serpentine pattern across rows as in 'Abelan', but just a one-row pattern which really shines when knitted with two-row stripes of two different yarns. Inadvertently I've also discovered that sequence knitting is sometimes a great opportunity for using up single skeins of yarn I have in my yarn collection. This scarf, for example, uses a skein of Zauberball sock yarn in long colour changes of black and white that I've had for years together with a ball of Patonyl (an enduring Australian favourite) I purchased for $5 at a recent Inner-City Knitters' Guild yarn destash. I hope I haven't made sequence knitting sound too complicated. It isn't. It's the absolute opposite of complicated as it simply takes combinations of purl and plain stitches - the very basic building blocks of knitting - and demonstrates the wonderful diversity of textures and patterns they can produce. I'm already off on another project! I love the scarf, and the book seems very enticing. 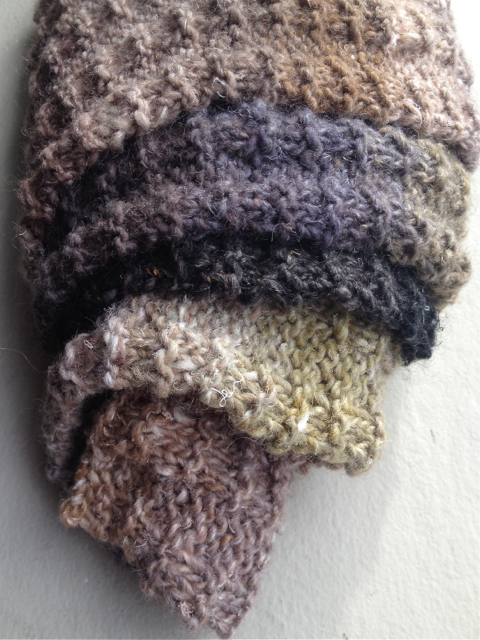 I love how you've photographed your scarves - the pictures really illustrate the textures and colours. I have seen many references to this book around the web but never felt the least bit interested by any of those comments. This post, however, (with those two fantastic pieces you've knit) has me planning to check into it at my first opportunity! I was searching the web for knitting in Amsterdam when I came upon your blog. I am tired of being an arm chair traveler/knitter. I love your work and the incredible photography. Do you have any reservations upon travelling in today's world of uncertainties? You now have a new follower in Tacoma WA. I nearly committed to buying the book today, but the cost from Amazon was prohibitive. Did you know that you can get them AUTOMATICALLY AND ABSOLUTELY FREE by getting an account on Like 4 Like? My life is filled by my family, my friends, knitting, reading and travelling. Occasionally, I'm diverted by other entertainments. Adrian McKinty (2017) 'Police Are at the Station and They Don't Look Friendly"